The eastern chipmunk (Tamias striatus) is a small, striped squirrel-like rodent found in North American woodlands. Its distribution extends from southern Canada in the north to Louisiana and the Florida panhandle in the south, and from the middle United States in the west to Virginia and the western mountains of the Carolinas in the east. The eastern chipmunk is a bustling little animal which provides amusement for human onlookers. The eastern chipmunk is solitary and diurnal (daytime and nighttime activity), and lives in a burrow of extensive tunnels, well-hidden entrances, and chambers for sleeping, nesting, and storing large quantities of food. In winter, the chipmunk retires to its burrow, enters a state of torpor, but wakens frequently to move about underground or to eat from its stores. It vocalizes with bird-like chirps, chips, chucks, and squeaks. Predators include hawks and foxes but its most formidable enemy is the weasel, which will pursue the chipmunk into the innermost reaches of its burrow. 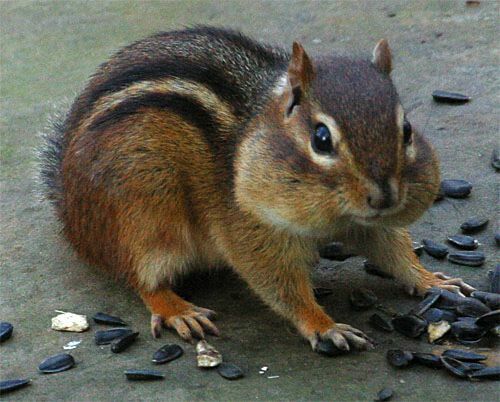 The eastern chipmunk is an omnivore, and its diet includes nuts, seeds, and fruits as well as insects. It breeds annually in middle spring, or biannually in early spring and again in middle summer, depending on the geographic region. Gestation is 30–32 days, and the young leave the nest at seven weeks. The species is subjected to internal and external parasites including two host-specific lice and a hypopial mite responsible for damaging the end of the tail. In the wild, lifespan is one to three years, and in captivity, nine years. In the far north, eastern chipmunks retreat to their burrows in October to enter a state of torpor (temporary hibernation) for a period of time. They reappear in mid-March. In the deep south, they retire in December and reappear in late-January. They wake often during the torpid period to move about underground and eat from their stores. A mild spell in December or January may bring some to the surface. Temperature-sensitive radio transmitters however have confirmed that the eastern chipmunk is a true hibernator. Respiration rates fall from 60 breaths per minute in the active state to 20 in the torpid state, and body temperature drops from 96–106ºF (35–41ºC) to 42–45ºF (5–7ºC). It is not known what stimulates hibernation. Eastern chipmunks build extensive underground burrow systems of tunnels and chambers. A chipmunk may use its forefeet to excavate part of the burrow and its cheek pouches to carry the excavated earth away from the burrow site, but renovation of old burrows or the burrows of other mammals is the primary method of burrow building. Pre-existing tunnels and burrows may be a requirement for establishing a home range. Some tunnels may dug deeply into the earth to manage flooding. Burrow openings are found near rocks, tree bases, or under the edge of a building. These openings individually measure 40–60 mm (1.6–2.4 in) in diameter, and are numerous along woodland banks, but difficult to see because the excavated earth is carried away and dispersed rather than piled at the burrow's entrance in the manner of other burrowing mammals. They have been known to chew into structures or use existing faults to gain access. They may gnaw on wiring within a wall and utilize insulation for thier nest. Chipmunks are not protected by federal law, but New Jersey requires additional permits. Exclusion, habitat modification, repellents, trapping, and shooting are possible means of dealing with chipmunks. Place bird feeders at least 15-30 feet away from buildings so spilled bird seed does not attract and support chipmunks.